There has been some confusion as to how the Rydeen MN312S GPS Navigation Mirror works with Guidepoint and their various services, so let’s take a look how they work. Out of the box, the MN312S is ready for Guidepoint’s “Connect” service plan. The “Connect” plan consists of Emergency Dispatch as well as concierge services. These services can easily be activated by pressing the red “Guidepoint” button on the MN312S. Once pressed the LCD screen will display a screen showing you are contacting Guidepoint, and play through the mirror’s built in speaker. 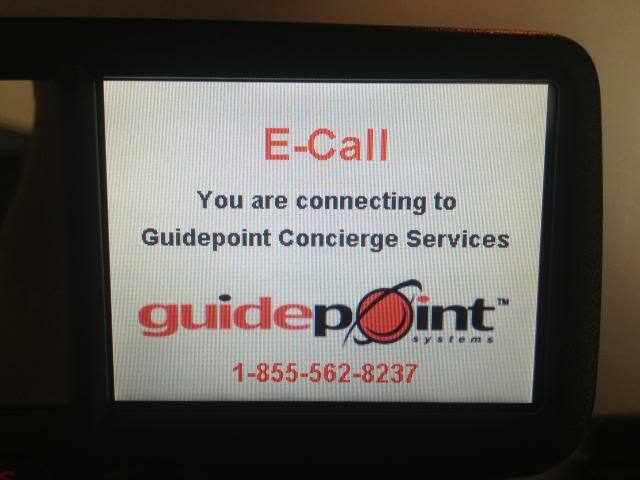 When pushing the "Guidepoint" button, this is the screen that appears. Inside the MN312S box is a coupon for the customer, offering them 50% off their first year of Guidepoint’s “Connect” service plan. The first year for the customer will be only $49! After that the service is $98 a year. The MN312S is also capable of working with Guidepoint’s GPS tracking services with their optional “black box.” With the right service plan GPS tracking, Theft Recovery and GEO Fence notifications are all possible. If you are interested in becoming a Guidepoint dealer, and packaging their box with the Rydeen MN312S, it’s recommended you contact Guidepoint sales. If you are looking to purchase a single box for a customer, please contact Rydeen Sales Support for assistance in the purchasing process.